Will Anne Arundel voters let George Johnson do it — or Steve Schuh? This is slightly edited version of a column that appears in the August edition of The Business Monthly serving Howard and Anne Arundel counties. June’s culmination of the fierce fight for Anne Arundel County executive between Republicans Steve Schuh and incumbent Laura Neuman may have given the impression that it was a one-act play and that the final curtain is down. But there’s now a second act in November, with Democrat George Johnson coming on stage to contest Schuh. It’s a return performance for Johnson, who lost the race for county executive to John Leopold in 2006 by 3,900 votes. That doesn’t sound close, but Johnson got almost 49% of the vote to Leopold’s 51%. Almost 90,000 voted for Johnson in 2006, and in three county-wide elections before that, Johnson was elected Anne Arundel County sheriff. He now heads the state’s Natural Resources Police, the 200-person force that patrols Maryland’s waterways and 66 state parks. Before his 12 years as sheriff, he was a county cop for 23 years and has lived in the county all of his 55 years. His previous jobs have given him the opportunity to “know the county budget, emergency management, teachers, public safety,” along with the business community. “Steve has not been in [county] government; he’s been in the private sector,” said Johnson. Schuh has been a state delegate for eight years, but his experience has largely been as an investment banker and investor. Johnson believes that Leopold, who resigned in 2013 after his conviction for abusing the powers of his office, had a similar lack of experience. It was Johnson’s impression from afar that Leopold never really “had his finger on the pulse” of county government. 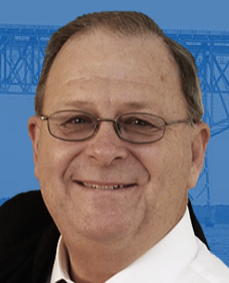 He believes the county was really run by the late Dennis Callahan, the former Annapolis mayor who was Johnson’s Democratic primary opponent, and then became Leopold’s chief administrative officer, the job Callahan held until his death in 2012. “Leopold was basically a person who filled the seat,” Johnson said. That’s a lot easier to say now that he’s not facing her in November. Johnson says he has four priorities for Anne Arundel County: education, economic development, public safety and the environment. Leopold and School Superintendent Kevin Maxwell had a contentious relationship, but Johnson thinks the new superintendent, George Arlotto, provides “a great opportunity” to improve the relations between the county government and the schools. “We need to let the parents know we’re with them every step of the way,” said Johnson. As Schuh does, Johnson believes that Anne Arundel high schools are too large, with more than 2,000 students in each, which he called “way too many in one location.” Schuh has made a long-term plan for building smaller high schools a major part of his platform. Johnson supports building the 13th high school in the Crofton area. “We haven’t had a new high school since 1982,” he said. By contrast, smaller Howard County has the same number of high schools, but with an average of 1,365 students in each. Howard County also spends more money on it students, and it also gets about $300 more in state aid per student than Anne Arundel based on how county wealth is calculated. Johnson believes teachers should be paid more. He said a teacher with seven years’ experience in Anne Arundel who moves to the Howard County system can get a $10,000 raise; not surprisingly, the teachers union has endorsed Johnson. Schuh has promised to add more than 100 cops during his first term if elected. All this makes Johnson sounds like he wants to spend more money. Where will that money come from? Like most candidates of both major parties in Anne Arundel, Johnson says he’s as opposed to tax hikes as the citizenry. “My administration is not planning on any increases in any fees or any taxes,” said Johnson. The new money is going to come through economic development, much of it occurring in the West County, which has four major economic drivers: Fort Meade, the National Security Agency, BWI Thurgood Marshall Airport and Arundel Mills. The county also needs to protect one of its other major attractions, the Chesapeake Bay, and the longest shoreline of any Maryland county. Johnson said he hadn’t really planned to run for executive again until people started approaching him late last year. Then Democrat Joanna Conti unexpectedly got out of the race, and he was all by himself in the Democratic primary. Schuh, who loaned himself $600,000, had $480,000 in the bank just before the primary, eight times more than Johnson’s $62,000. Johnson said potential donors were telling him to ask again after the primary, and the money is starting to come in. In the 2006 race, he raised $1.2 million, he said. “I believe people believe in my candidacy,” Johnson said. He was encouraged by his numbers in the primary. With no opponent, Johnson got 26,606 votes from Democrats; Schuh got 17,563 and Neuman got 14,776 from Republicans. “I’m already getting numerous calls from supporters of Laura Neuman,” Johnson said.